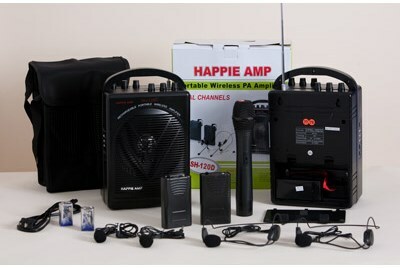 Happie Amp 2.0 is a 50 watt max., portable, wireless, 5 pound pa system for audiences of up to 400 people indoors or 200 people outside. A: The entire package is under 7 pounds. The speaker itself is about 5 pounds. Q: Is it UHF or VHF? Q: Can I play music through the system? A: YES - it has a couple of 1/8" audio jacks. That is the most common size and type for music. It will work with your iPod, MD player, CD player, Laptop, etc. Q: Can I use both mics at the same time? Q: What are the dimensions of the speaker? A: 11.5" tall includes the handle, 7" wide, 4" deep. Q: How many people will it accommodate? A: This unit has been used for 400 kids in an auditorium or about 200 people outdoors.